The Herbal Cough Syrup, also known as Histex Plus Syrup, has been one of the most potent remedies against cough. 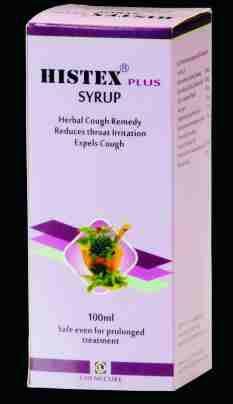 The Herbal Cough Syrup reduces throat irritation and expels cough. The clients can avail the Pure Herbal Cough Syrup at the best prices from the company and the packaging is durable. Indications : Cough of Varied etiology. Adults : 1 to 2 teaspoonful twice a day or as directed by physician.